Mercy airlift: l/r Stephanie Pavone, Fipe Howard. More than ten tonnes of relief supplies are being airlifted from Australia to flood affected areas of Fiji after a remarkable grass roots campaign by Fijians of all races living in Sydney. An outpouring of generosity from ordinary Australians responding to media reports of the floods saw complete strangers leaving packages at the homes of their Fijian neighbours. 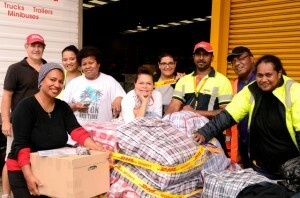 “I went outside and there was this box full of beautiful kids clothes labeled simply – To the Children of Fiji”, said Joweli Ravualala, one of the organisers of the airlift. 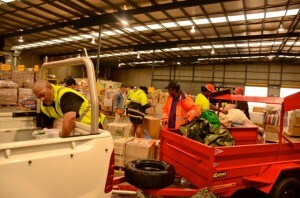 “The way Australians have rallied around us to help the relief effort has been fantastic. We know they like to holiday in Fiji but it’s amazing to see how much ordinary Australians love the country and its people”. Mr Ravualala said he had sometimes been deeply moved by the kindness shown to the volunteers involved in the appeal.“One elderly lady spent two weeks of her pension on relief items. When I went to pick them up, she also insisted on giving me money for petrol and my lunch. I was so touched I went outside and burst into tears”, he said. The airlift is the culmination of three weeks of intense effort by Fijians all over Sydney, some from community groups like the Methodist Church and others “Old Grammarians” – ex students of the Suva Grammar School. One of these, Merlyne Jamieson, lit the spark with a simple Facebook posting that became a viral internet campaign on behalf of flood victims. “I simply said in one posting ‘ we have to do something to help these people’ and it set off a chain reaction across the social media. I couldn’t believe how quickly it spread and how many people it reached”, she said. As well as the internet, the organisers had another key ally in the form of Fipe Howard, a Fijian broadcaster on Radio Skid Row.“Fipe was able to publicise the collection points for relief items all over Sydney and the stuff just started pouring in”, Ms Jamieson said.“It was mainly our houses and garages. I’d come home from work every night and there’d be a whole stack of fresh items left on my front porch”. The wave of contributions was so great that some volunteers found themselves overwhelmed. “I had to tell everyone ‘enough, enough” because I simply had no more room for the mountain of things being left by the public”, Joweli Ravualala said. The organisers were at first concerned about how they would get the material from suburban Sydney to the flood affected areas in Fiji. Air Pacific came to the rescue, offering to fly the entire shipment free of charge. “Air Pacific and its Sydney manager, Victor Sharan, have been wonderful”, Merlyne Jamieson said. “It’s times like this when you realise how important the national airline is to Fiji because who else would have done it?”. 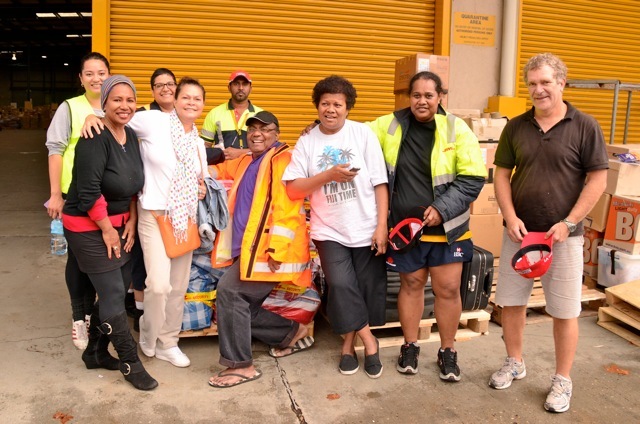 An army of volunteers, including former Suva resident Mark Petersen and beauty therapist Fulori Bakoso, took time off work and used borrowed or rented trucks and vans to ferry the donated material to a central collection point. This was the vast freight installation near Sydney Airport operated by another company with Fiji ties –DHL -which also provided its services free of charge. One of DHL’s Fijian staff, Rohit Naidu – formerly of Lautoka – supervised the loading of the pallets assisted by a team of volunteers including Stephanie Pavone, Lily Wong, Luse Vula and George Fonmoa. 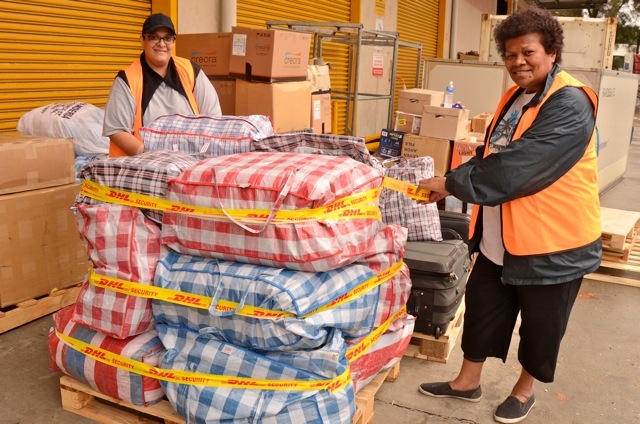 The consignment consists of a vast array of clothing, personal and household goods plus large amounts of non-perishable foodstuffs headed for Nadi and the distribution network of DISMAC – Fiji’s disaster relief agency. “They should be pleased with what arrives”, Joweli Ravualala said. “ One shoe shop in North Sydney donated hundred of pairs of new shoes so there’s going to be some very smart looking feet in the flood affected areas”, he laughed. The organisers of the airlift have expressed their thanks to everyone who gave donations of cash and goods and the volunteers who provided their time and all the lifting. 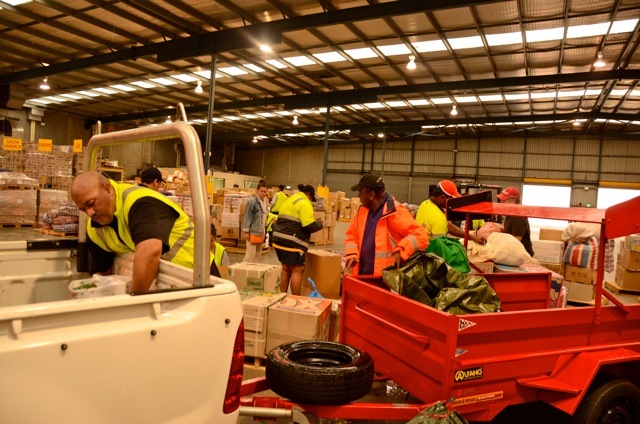 “We’re especially grateful to some of our employers, who understood that we needed to take time off to help people back home, donated things themselves or lent us the vehicles we needed to move things”, Merlyne Jamieson said. It’s also made people extremely proud to be Fijian. “ This has united the Fijian community in Australia – the Indo-Fijian community groups, the i’taukei churches and everyone who became involved”, Mr Ravualala said. “Above all, our thoughts and prayers are with those affected by the floods in Fiji. However tough things are, we hope it’s some comfort that they are not alone. There are people overseas who care”. The article is also appearing in the Fiji Sun. I thank them for their time and goodwill.It is also good to see Indo-Fijians are reffered as Fijians. However I dont see any such help from Coup 4.5 and Democracy movement in Australia or Ulai Mara. Looks like case of big talk but no action. I totally agree with Rama. Unfortunately the same & lame story with the SDL front group (veiled in the ideals of democracy) which Suli Daunitutu heads, that are orchestrating these protests in Australia, but have not attempted to rally support for donations for the flood victims. Daunitutu,Mara,Baledrokadroka and their cronies in the democracy group have nothing to donate cause they are broke. What a great bunch of Australian Fijians. Makes me proud and I thank them from the bottom of my heart. Totally Awesome! Vinaka vakalevu guys. Very much appreciated. Loloma levu mai Viti. The New Zealand Based, Council For a Democratic Fiji, were a major part of the Radio Apana appeal which raised over NZ$220,000. Ratu Mara is one of the leaders of that organization. By the same token how do you expect anonymous blogsites to take part in fund raising. The reason these sites are anonymous it their contributors fear reprisals to both themselves and their families. It would not benefit fund-raising if the donors thought having their picture taken donating to the C4.5 flood appeal would get them in trouble. Let me ask a question what has Bainimarama personally donated? He has one of the biggest salaries in Fiji but to date, he and his family has not made a personal donation. We would know if he had because the pictures would have been all over the Fiji Sun. The biggest donations by far have come from Australia and New Zealand. The 2 countries that the dictator, with Grubsheet’s encouragement, dares to say are not our friends. They are Fiji’s true friends. Just not friends with a tinpot dictator. Thank you Australia and Thank You New Zealand. Thank you for being our friends. I would also like to thank Fiji’s much lauded new friends for donating less than one tenth of what our old friends have donated. Last I heard Mara was living on charity.Cut the bull you idiots hiding under democracy banner are bunch of con racist and as for coup 4.5 it is a hate site.Shame on you cowards. I don’t know about Ratu Mara’s living arrangements. But what I do know is the organization that he fronts took the time to help raise NZ$220,000 for the flood relief in Fiji. How much did you raise or donate? To say all people who are Pro democracy are racists is quite the most idiotic thing I have read on this site. It is just like me saying Rama is an idiot and he supports Frank so all supporters of Frank are idiots. Hang on a minute that might be true. We all are idiots so I can live with that.But you are lower than a coward by using someone elses name.At least I put my name to my contribution to this blog. Bainimarama wants true democracy.Democracy movement in Australia and NZ wants democracy that looks after one group with handouts. I have contributed far more than my share. But wait you are a coward you only take people like you dont give. Mara is living on handouts what a shame. Wonder if he send all he collected to Fiji. You are full of wild allegations but no facts to back them up. You sound exactly like the Bainimarama regime. Full of Rhetoric but no actions to back up the talk. While you rant Fiji is going broke. I would hate to see you guys commenting bad about a person who stood up to say.. STOP!.. DONT SPEND CITIZENS MONEY! You say Bainimarama rants about no money… Of course he is doing that.. all previous Elite Fijians siphoned that money from FNPF and National Banks. We are still paying back. The backbone of Fijian Resource… Forestry… sold underpriced to USA company… Who intervened to stop that deal.. and bring back the forestry pricing to world market pricings? Only Frank can do that.. not you..
Who Stopped the FNPF and brought to the current restructure to see that FNPF profits and so does its members? ONLY FRANK CAN.. you cannot! WHO GAVE THE MEDIA to be pro country in the pacific? ONLY FRANK CAN >> YOU CANNOT! Now you justify the following.. I have my justification for the above,, I want your justification for the expenses you mentioned that shouldnt have taken place? When Merlene Jamieson, Fipe Howard and Jo Ravulala et al were planning over Easter on how to help the flood victims in Fiji, the pro democracy group in Canberra, led by Suli Daunitutu and John Baleidrokadroka accompanied by the usual pro SDL suspects, were planning their ‘Black Tuesday’ poltical demonstration outside the Fiji Embassy in Canberra. For them, scoring a political point at a time when people were reeling from a disaster, was more important. They gave no thought or care given to the inappropriateness of their political point scoring. What a sorry and misguided lot! Congrats to Merlene, Jo, Fipe and the Sydney crew. You showed that when Fijians of all backgrounds work together in a spirit of giving to those less fortunate, all things are possible. Vinaka vakalevu. @ Rama is an Idiot: You have obviously not read the racist tauntings and degrading comments made by the pro-democracy crowd on another US-based blog site. Please pull your head out of the sand and take a reality check. @ Guy Threlfell; You question how much has Frank and family donated. The same can be asked of your hero, the absconding debtor and traitor to Fiji, Tevita Mara. How much did he personally donate? At least Frank is leading from the front in Fiji. The same cannot be said about Mara who has sold his soul to a foriegn government. I think it is clear to everyone there are no heroes in Fiji. There are a few heroines but definitely no heroes. Frank is not leading from the front. The camera is leading and Frank is following for every possible photo opp. The regime, which he has led for 6 years, is so poor he has not been able to divert any government funds to the flood victims or for rehabilitation works. He has promised dredging but there is no conclusive evidence that dredging will solve the problem. As always he is having a knee jerk reaction to a situation in the hopes of gaining popularity and will just waste what limited money is available. With regards to Tevita Mara. He is definitely not my hero but to say he sold his soul to a foreign government is so far from the truth. He got set up with trumped up charges by Bainimarama and Khaiyum. We always suspected it but we know it for sure now. Nearly 12 months after his and Driti’s arrest the prosecution still has no evidence to put in front of the court. This is just another example of justice tinpot dictator style. Well if Mara was innocent he should have stood his ground and showed courage like Driti who is a true Kubuna warrior. Instead, at the first sniffle, Mara, the scion of the Mara family and pretender to the Tui Lau title, cuts and runs. He does not have the guts of a Kubuna warrior like Driti. Isn’t this the true character of a bully? – when confronted they chose to cut and run (conveniently too because of his staggering unpaid debts in Fiji). Is Frank also responsibile for the global financial crisis, global warming, climate change etc? All of these things have impacted negatively on the Fiji economy as they have done so to many other regional economies. You are being disengenous Guy and you know it. i WOULD LIKE TO TELL THOSE ACTIVISTS WHO DEGRADE OTHERS BY CALLING NAMES ,,, THAT IT SHOWS IN THEIR SKIN THAT THEY ARE LOOKING ONLY NOSE DISTANCE,,, IN FACT THEY ARE SPRINGING UP TO BE SEEN AS FANATICS, UNREASONABLE PEOPLE, ONLY LITERATE ENOUGH TO WRITE SENTENCES AND NOT UNDERSTAND THE MEANINGS.. A VERY GOOD QUALITY OF itAUKEI ACTIVISTS. ANYWAYS… VERY WELL SAID KATHY..
Ooohhh this has turned sour. We must work together for our people back home who are the ones that need our support the most. The article was great about a group of volunteers in Sydney and if the ones in NZ raised $220K, I say well done but let’s not bring our Political views to this forum. It’s all about the Flood Appeal for Fiji. Hey, also noted a George Fonmoa of Sydney helping out. Is this the same guy that played rugby for Raiwaqa & Suva?Picture was not clear and I couldn’t make out whether he was the rugger who once brought Raiwaqa rugby to a new dimension in the early 80’s. If anyone can confirm, I say vinaka vakalevu again! He’s got Fiji all over him. Please lets work hand in hand together for our beautiful Fiji. You right blood will flow in Fiji and it will not be I-taukei blood when we hang Bainimarama. People like Mara, Adi Kepa and Guy Threllfell will ensure this. This idiotic statement was not written by the Rama is an Idiot who wrote the first 2 posts by Rama is an Idiot. Taura vakamalua tagane. Waraka ga na veidigidigi e na 2014. Sa na warai kina o Kepa, ya. This is not a hate site, go to other hate sites like coup 4.5 if you want to preach hatred. And to the clown, The real Rama is an idiot, using someone elses name does not make you real. To all those people who donated and those people who were involved in the collections, heartfelt thanks from Fiji for your kindness and your efforts. To all those people who made this page a forum for you to air your political grievances and snipes, shut up, get over yourselves and stop acting like whinging kids. The floods were an act of nature, not brought on by any man or political party. I am sure that the victims of the floods are eternally grateful for the assistance, regardless of who it came from. Thanks so much for the great effort and for the love you have shown to those who were affected by the recent flood. I also do felt sorry for Mr Rokocoko for all those 3 containers which were off loaded here at the wharf which were supposed to be delivered directly to his village in Nadi and he was told by the customs personnel that he was allowed to take only 2 containers and the 3rd one has to go to the Fiji government. Peace be with you all. 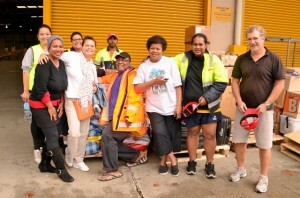 Bula to Everyone….the uplift of goodies to Fiji was a combined effort by all ex Fiji people living here in NSW and in particular Sydney….and it was purely a humatarian efforft with no affilication to any political parties or group…..it was simply asking a fellow Human Being can you help ! !…it was an amazing …amazing experience…the Human Spirit truly soared !!.. I don’t want to read too much to some views expressed above cause it just becomes upsetting. The people that donated and helped…thank you…it was an awesome expirence…I love you …stay well !!! God Bless Fiji ! !